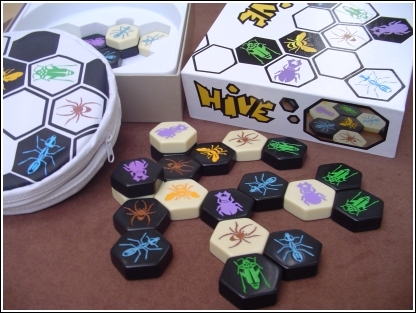 Hive is a board game with a difference, there is no board, as pieces are added to the playing area they create the board, then as more pieces are added, the game becomes a fight to see who can be the first to capture the opposing queen bee. The soldier ants battle to keep control of the outside of the hive, whilst the beetles climb up to dominate the top, spiders moving into holding positions as the hoppers jump in for the kill. Keeping one eye on the hive and the other on your opponents reserves, the tension builds as one wrong move will see your queen quickly engulfed. My boyfriend loves this game. He's been talking about the strategy and can't wait to show it to me. Little does he know I've bought it for him for Christmas, along with the extension Mosquito pack! An excellent abstract strategy game. The low number of types of pieces makes it very easy to learn, but it still has a lot of depth. My only suggestion is to not allow bee placement as the first two moves, otherwise between players of equal skill level, it will often end in a tie. Hive is an abstract strategy game that feels somewhat like chess due to the variety of pieces (each with their own movement rules), but plays much differently. This game is perfect for restaurants and bars because all of the game pieces are made of durable plastic and there is no board to get ruined by spilled food or drink. Delightful little game that is simple to learn but deceptively deep. It's the perfect coffee house game. Definitely check it out. In essence, an abstract - but the theme works really well. Strategies are much deeper than they first appear. This is an abstract that feels very thematic. While the pieces in e.g. chess are very generic, and there isn't really any good explanation for why they are the ones that they are, in Hive they seem to fit the game much better. It is a challenging game to learn - primarily due to the free placement of pieces (as there is no board), which can overwhelm newcomers. Hive is a 2 player game that can be compared to chess in that there are different types of pieces that each move in different ways and there can be a satisfying amount of strategy. The goal is to surround your opponent's queen. This game is very portable (the pieces are sturdy and can be played ANYWHERE without fear). Unlike chess, this game is actually fun :P This is an EXCELLENT cafe game. Enjoy! This is a fantastic abstract strategy game - I couldn't recommend anything more. While fun and easy to pick up, a few games will demonstrate how much more there is to Hive. The new bakelite production is also amazing, and the game comes with its own little bag for easy storage and travel. I love this game. WOW! Just played this one through for a few days...only three words can sum up my feelings at this point: DESTINED FOR GREATNESS. It's the tactile sensation from the folks at Gen42. Very good game, superb pieces. My lack of skill at it and the fact that the bugs could really be anything don't stop this from being an awesome game. Bugs, hexes, and chess, oh my! I bought this game to play with my wife when we go on trips. We have played in hotel rooms, at restaurants, even outside around a campfire. This game is much like chess where you are attempting to capture your opponent's Queen Bee(no king here) while maneuvering your hive around with varying types of movement. We do have Hive Pocket though it travels amazingly with such great pieces.